A combination of trams running on Sydney’s new $2.1 billion light rail line and buses will boost public transport capacity from the eastern suburbs of Randwick and Kensington by up to 30 per cent during morning peak hours, the state government says. The number of passengers the government expects the 12-kilometre line to carry once it opens in 2019 has come under attack from opponents of the project. They argue the removal of buses from existing routes will lead to a significant fall in public transport capacity to Sydney’s south east. However, Transport for NSW forecasts the combined tram and bus network will boost city-bound capacity by more than 10 per cent from Kensington, and 30 per cent from Randwick, during the morning travel peak. The felling of Moreton Bay fig trees on Anzac Parade for the light rail line has been highly controversial. It also predicts a doubling in morning capacity in the other direction from the CBD to the University of NSW and hospitals in Randwick. As part of changes to the transport network, bendy buses will gain priority on routes to the CBD from the southeast, replacing smaller standard buses. 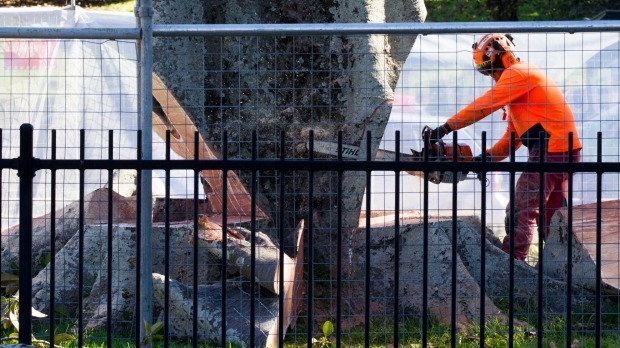 The felling of trees – especially century-old Moreton Bay figs on Anzac Parade – to make way for the light rail project has also sparked public outcries. CBD transport coordinator general Marg Prendergast said she understood the emotion surrounding the removal of trees but “the accusation we are clear felling is just not true”. So far, 23 Moreton Bay figs located along the entire length of the route have been felled, and a further eight are under consideration for removal. She said at least 81 of the 112 figs would remain once the light rail line was completed. Fewer than 10 trees of all species – one of which is a fig – are still to be felled between the Tibby Cotter Bridge on Anzac Parade and the intersection of Alison and Darley roads. Ms Prendergast said the oft-cited figure that the light rail project would lead to about 220 fewer bus trips within the CBD during morning peaks encompassed the government’s changes to the broader transport network. That process began in October when the bus network in the central city was overhauled. “It is absolutely ridiculous that we would reduce capacity. This is all about positioning us to cater for growth,” she said. Some 15 trams will run in each direction every hour between 7am and 7pm – equating to a service every 4 minutes along much of its route. The line branches to Randwick and Kensington mean services will be less frequent along these sections. The trams will be more than twice the length of those running on the inner west line between Central Station and Dulwich Hill. Transport for NSW said the removal of 180 buses – both citybound and outbound – from the city centre between 8am and 9am represents capacity for 9000 people. “This is comfortably replaced by the 6750 customers light rail will carry in each direction per hour,” it said in response to questions from Fairfax Media. The buses to be removed on routes from Randwick and Kensington will be the standard vehicles that carry about 50 passengers each – not the longer bendy buses that will remain on express routes to and from those suburbs. Precise detail for exactly how many buses will run between the CBD and the south east will be developed next year using data from the Opal electronic ticketing system. Ms Prendergast said origin and destination data from the Opal “is gold for us” in predicting demand and adjusting the network accordingly. “We have never had that granular information. It allows us to de-congest the corridor [to and from the city’s south east],” she said. Within the next two weeks, the construction zone in the CBD for the light rail will stretch from Circular Quay to Liverpool Street in the city’s south. Ms Prendergast said pressure on Bathurst Street – an important traffic corridor in the CBD – would increase in the next few weeks weeks once George Street was closed between Alfred Street at Circular Quay and Liverpool Street in the south. The laying of tram lines through Surry Hills will also present a challenge because of the suburb’s narrow streets and large number of trees. A figure on the likely number of trees to be removed on Devonshire Street, which dissects Surry Hills, has yet to be finalised. “We are really conscious of Surry Hills and how we deal with it,” she said. Public transport advocate and tram expert Greg Sutherland said he was concerned that too many trees had been felled because vegetation was being removed to meet specifications for a heavy rail line instead of light rail. “I would take anything they say about tree numbers with a grain of salt,” he said. Transport for NSW said the standards for the light rail required clearance for tree branches of 2.5 metres and trunks of 2m from overhead wires and the trams when they were in motion. Despite the claims of some opponents, Mr Sutherland said he believed there would be adequate transport capacity to the south east from the light rail line. Dear Margaret, what is the SEATED capacity of trams compared with the replaced buses? Some of us are over 40 or otherwise loaded and don’t want to stand. Apparently, the figures for capacity are based on 7 passengers per metre both seated and standing. This seems very tight and uncomfortable to me but I guess we will see. What is the seating capacity of the Circle Metro with carriages comprising 52 seats? 416 per train. That’s 12,480 per hour. That’s almost 25,000 in the two directions, remembering that it is a CIRCLE. The total capacity (seating plus standing) in two directions is 55,800 per hour X 2 = 111,600 per hour. Speed of metro trains is 80 kms. The Circle Metro is a 23km metro line with 19 stations that includes White Bay, St. James, SFS, Kensington, Domestic Airport, Sydenham, Stanmore and Annandale. Why hasn’t the best public transport option been adopted and the slow, inadequate light rail option terminated? Now the trees are gone they admit that trams don’t have the capacity. Forget the poor locals trying to get to Randwick and Kingsford: they don’t stand a chance against the tens of thousands of UNSW students who will converge on trams. Those students currently get express buses. Guess what: they will now continue to do so. There can’t be express trams. UNSW has more than 50,000 students (admittedly, not all at Kensington). How were trams ever going to substitute for buses? Now that the trees have been felled, the jig’s up. Ms Prendergast, not one sentence you have uttered has convinced me of the worth of this project. If it makes George St ‘nice’ for Ms Moore, I guess that’s something, but public transport for a massive daily commute it is not. What shocking vandalism. Couldn’t agree more! Lets get the government to explicitly state what the benefits are or stop the project! And how much above rail infrastructure will be manufactured in Australia? Absolutely. Whether it’s the Sydney light rail or the NW metro line, the govt just needs to ignore the usual bunch of whingers and get on with it. We are not “whingers”. We just want the best public transport options adopted. You should not be supporting poor government transport choices such as light rail. Poor choices? Like light rail that the rest of the world has embraced, that is so popular on the inner-west link that they’re having to put on more trams but somehow won’t work in the city’s east? Light rail is world class and prescribed by transport experts around the world. It’s a first step to meet current and near future demand, down the line it can be supplemented with a metro. I suggest you read a transport experts plan for Sydney – http://www.planning.org.au/documents/item/1493 where he describes a light rail network for the inner city suburbs. I quote from the Barry O’Farrell and Nick Greiner infrastructure Australia Report of 2012 “First Things First” advising AGAINST light rail for Sydney. The narrowness of George St may mean that a high capacity light rail service is fundamentally incompatible with a high quality pedestrian boulevarde along this corridor…(it) will require light rail to proceed at low speeds for safety reasons. Buses therefore remain the most appropriate public transport mode for most of Sydney over the next two decades…Light rail is however, significantly more expensive than bus services, has no material speed benefits, is less flexible in traffic and if service reforms to the operation of CBD bus services are implemented, does not offer significantly greater capacity. As other cities have learned to their cost, an ill-considered light rail plan can lead to years of disruption and financial disaster, for example in 2008 the city of Edinburgh began construction of light rail, with a target completion date of early 2011. The latest completion date is now forecast for 2014, with project costs at over $1 billion, at three times the original estimate. Jerusalem started construction of light rail in 2002. With repeated delays and a doubling of costs to US $1 billion it took nine years before it became fully operative in December 2011. The light rail should have gone through all the new densely populated residential housing developments in the south eastern part of the city fringe. IE, from Bourke Street in Waterloo to Alexandria and so on. The ordinary traffic running along Bourke Street is now unbelievable busy because of the increase in population, and public transport is hardly keeping up with it. The M20 buses going along that route are so full with passengers, that they don’t even stop to pick up passengers during peak time anymore. It’s totally beyond my comprehension how the Govt failed to plan for the massive increase in population in those areas when they were planning the light rail. In addition, there once were trams running through those now densely populated areas – the old tram tracks are still visible. Why couldn’t they just reopen some of the former lines, the streets were built for them! The Circle Metro and Stage 1 of the Olympic Park Metro (to Kensington) should be built and the illogical, isolated, inadequate and unintegrated light rail project scrapped immediately. The Sydney transport plan should also be utilising existing train lines and stations that were built 80 years ago. There has been no effort to take this simple and cheap option. It’s too late but …… the planning leaves much to be desired. Route should have been cut / cover tunnel under Foveaux, thence to Moore Park. A little more expensive but faster (grade separated) and hardly any trees to be removed. But gov’t “knows best” !!!! Does the light rail at Kensington and Randwick mean that those of us coming from the South Eastern suburbs, South Coogee, Maroubra, Matraville, etc… will be forced onto trams? Chopping down century old trees in the middle of the night is appalling and unnecessary. The secrecy that surrounds this project is disturbing. There was an alternative route that could have been designed which would not have led to the senseless loss of such stunning trees. This project gets an F for Fail. I drive/walk along Allison Rd quite regularly. I can still see thousands of trees. Removing a few does not spell the end of the world as we know it. How many trees were cut down to build your residence? Sick of this fixation on toy trains. Stop wasting our taxes and fix our roads! Getting people out of cars and into public transport is the best way of fixing our roads. One bus with 70 people takes up the same road space as 3 or 4 cars with 3 or 4 people in them. Which is the most efficient? And it is much safer to phone your friends, update your Facebook page or read your txt msgs out of the car. Sorry, but why is Randwick not serviced by heavy rail? Coogee is one of the State’s most densely populated suburbs. Heavy rail should be servicing both the stadia (SFS and SCG), Randwick racecourse, Prince of Wales Hospital and UNSW. It is just ridiculous that we expect the light rail and buses to service this area. Light rail could then service the suburbs of Maroubra/Malabar and Coogee from Randwick. Could not agree more. Its the best solution rather than a tram that does bugger all for 90% of the residents down these Eastern Suburbs. Good point. And why doesn’t the tram actually go down to Coogee ? On the inner west line trams are usually 10 mins apart (sometimes 15mins from 6:30pm). Most of the time they are jam packed except on school holidays. . They really need to increase the frequency during peak hour to every 5 mins. I think they need to do some awareness around light rail etiquette. eg Spread down the carriage, don’t lean on the hand rails so others can hold on, watch your backpack on your back, give up your seat for mums & dads with kids. At Lilyfield station they took out a new seat on the platform for a ticket machine that doesn’t work. And now there are only two seats. The new station awnings dont even protect you from the rain. Good luck when the network increases in size. The light rail to the south east was never intended for public transport. It’s urban transport carrying punters to the football stadium, University and Racecourse, paid for by the public. It barely goes past any residential areas and almost all commuters will have to catch a bus to where the light rail terminus is (Kingsford and Randwick) and line up again before they can even get on the light rail. According to the Environmental Impact Statement, the following bus routes are to be eliminated or deployed away from the city: 343, 373, 374, 376, 377, 391, 392, 393, 394, 395, 396, 397, 399, L94, M10, M50, 610, 890, 891, 892. All passengers travelling on these buses will need to change to a tram, wait for up to 8 minutes, then stand up with 330 other passengers out of 450 passengers, for a 35-37 minute journey to the city. Is this more comfortable or convenient? If we are only increasing public transport capacity by 10% and we are keeping all these buses, then it begs the question, why do we need light rail at all on this corridor? Is it really worth spending over $2.1 billion dollars? Surely a fleet of electric articulated buses made on the gold coast, designed by Swinburne university that run all day long on a single charge with no wires would be more beneficial for our city? Quiet, safe, better. Benefits: George St can still be pedestrianised and car-free, no trees get chopped down, no roads dug up, no gridlock and congestion resulting from removing 2 whole lanes from Anzac Parade and over 1000 car parking spaces, and making small businesses go bankrupt? According to the governments’ own documents, the capacity of light rail will remain 6,750 passengers an hour for the first 10 years of operation. I live in Maroubra. Instead of getting 1 bus to the city (seated) I will now have to walk further to catch a bus to Kingsford, change to a tram and stand to the city. That’s not progress. I’m very concerned also about the development that will accompany the infrastructure – no consultation with residents allowed! There will still be express buses to the city! They have always said that! Concerned… your comment is all about you. Many people catch busses to heavy rail stations all around the city every day. That’s how public transport works. It’s much better than ramming hundreds of busses into the city every day. The good news for you is that, until the tram is extended to Maroubra, you’ll be the first at the terminus and will most probably get a seat every time. As for development, much of the outer east and inner south is vastly under populated with large tracts of former light industrial land, now disused. People have a right to live closer to the city rather than sprawling out west and it’s not about you having all the open space. Think of others. Capacity of 9000 people “…comfortably replaced by the 6750 customers light rail will carry in each direction per hour”. It won’t be very comfortable for the 2250 people left standing beside the road. We chopped down a third of the trees on Anzac Parade for this? It’s insanity! Trains should run on dedicated tracks and NOT on roads. See Bradfield’s train network. Not one of Bradfield’s trains run on a road. Do you know the difference between trains and trams? Agreed. What would Europe know. Or Melbourne? Or a dozen cities in the US? etc. etc. Why didn’t they just finish the Eastern Suburbs railway line? “predicted” – that’s the point. They have no idea and like usual are basing their assumptions on…guesstimates. Further, how is it Melbourne can lay 800 mtrs of track and put in two tram stops in the space of 48 hours, yet this project is just dragging on? Having been associated with many tram projects in Melbourne I can say that whoever is managing this mess should be fired. Bring in the adults to finish what the children could not. Chris, this project is not dragging on. It only just started and it’s on schedule. Having been associated with the trams in Melbourne, you’d know that these light rail sets are very different beasts. Nonetheless, why don’t you submit your resume and offer the benefits of your experience to the roll out team. Could the public servant rocket surgeon who came up with the idea of diverting express buses from the 70kmh Anzac Parade into the 40kmh Moore Park busway please explain themselves? I sit on the express bus watching all the traffic pass us by as we meander through the 1 lane diversion! Do what we did, get out of the area! Now living in the peaceful surrounds of the south west. Access to trains, no more apartment city feeling and no noisy light rail construction and congestion. According to official Transport for NSW information, the following bus routes are to be eliminated or deployed away from the city: 343, 373, 374, 376, 377, 391, 392, 393, 394, 395, 396, 397, 399, L94, M10, M50, 610, 890, 891, 892. Surely a fleet of electric articulated buses made by Bustech on the Gold Coast, designed by Swinburne university that run all day long on a single charge with no wires would be more beneficial for our city? Benefits: George St can still be pedestrianised and car-free, no trees get chopped down, no roads dug up, no gridlock and congestion. 2 whole lanes are retained on Anzac Parade and over 1000 car parking spaces. Here we go again. Another story to incite the NIMBYs and very successful it has been too. The light rail is an excellent project. I, for one, am looking forward to its completion, as are many people in the area. I’m a bit over the “won’t someone look out for the trees” outcry. Had the original tram line been kept in place, those trees would have been chopped down years ago to prevent track damage from their roots. Although somewhat majestic, figs are little more than oversized weeds and were, in hindsight, inappropriate planting choices. It’s a shame they are going but that’s now a fact. Let it go. Maybe there’s a fence being built somewhere that can attract everyone’s attention for a while. Another thing the hand wringers seem to overlook is that this is only the first stage of the light rail. Eventually it will continue the path off the old tram, reaching booming populations in Maroubra, Little Bay (ready for the gaol to close) and maybe even back to La Perouse. That would not be possible or affordable with heavy rail. Bring it on and congratulations to the Baird government for having the guts to invest in this sort of infrastructure despite the naysayers, rent-a-whingers and ill informed. Damian, the tree carnage has only just begun. As inconceivable as it is that Marg Prendergast justifies that its OK to kill 31 irreplaceable Moreton Bay Figs, the important detail that she has left out is that the massive Moreton Bay Figs along the busway are to be root pruned and canopy pruned to facilitate the installation of poles and wires. Figs that got “Pruned” for the Cahill expressway all languished and died within 5 years. My heart breaks even just thinking of this. Charles Moore, the Lord Mayor of Sydney and Director of The Royal Botanic Gardens planted these trees for us to enjoy and Mike Baird and co. are taking $2.1+ billion taxpayer money to clear fell (Yes, Ms Prendergast, clear fell 760 trees (31 Moreton bay figs included) and impact a total of 871 significant or heritage trees, for a tram. Many people are so upset they are already moving away. But some of us are staying to defend our natural and built environment. Stupid transport decisions happen all the time, but when they needlessly kill heritage trees, it is time for action. It’s a real shame that our national media won’t pick up on this story. If only Murdoch, Packer, Lend Lease and co. cared as much about the natural and built environment as did previous generations of businessmen/women. However, we must THANK these people for waking us up to what is really precious in our lives. As the light we shine on this debacle gets brighter, hopefully these people will also see that this beautiful city is worth saving, and that there are so many other ways of generating ‘jobs and growth’ that don’t involve the destruction of our beautiful city. This project isn’t designed to shift people from buses to trams. It’s designed to attract new public transport customers, out of their cars !!! Didn’t you read all the propaganda last year ? Original claims about capacity included the ability to move 18,000 passengers an hour from Moore Park to Central station during event days. Where do the extra trams come from (and fit in to the system) to do this if the regular service is running every 4 minutes? Meanwhile, for those living in the Sydney’s west…. *crickets* Thank your lucky stars your getting anything at all!